Widely regarded as one of the most challenging amateur road cycling events in the country, the TfN has become something against which you measure yourself. We at Sita Bhateja Speciality Hospital have been proud to support the TfN as its medical partners since its inception. Our team of doctors and medical aid facilities make sure that all riders have to worry about is their next pedal stroke. In addition to this, pretty much our entire Team Spectrum has ridden the TfN with distinction on more than one occasion. Last year, in 2013, our Team Spectrum rider, Gautam Raja rode the TfN as a ‘charity rider’ to raise more funds for the Jetha Nand Hospital for the Poor. In one of those interesting circles of life that we encounter, he just happened to have been brought into this world by our late founder – Dr Sita Bhateja. Gautam’s effort helped raise more than 80,000 INR for the hospital’s charitable wing. You can read more about his experience in the soon-to-be-released newsletter. If you would like to help us help more people in need, click here to find out more. A little more than a year ago, I weighed in at 125 kilos. I had been battling obesity for years and it had taken its toll on me both physically and mentally. I was even borderline diabetic. All at the age of just 29. Then something changed in my life. My elder brother Arvind has been an avid cyclist for years and he lent me his old mountain bike. I took to cycling around the neighborhood for short rides. My rides grew a little longer and with each ride my passion for it and confidence in myself increased. I then took the leap to racing in local community rides. The great companionship and encouragement I received boosted my self-belief to ride harder. Today, a year later, I am down to 75 kilos. I have lost 50 kilos and counting and at this point, I would like to give back to society through the hospital that has been an indelible part of my life. As the son of Dr Sita Bhateja, and both as a member of the family and an employee of Sita Bhateja Speciality Hospital, I was brought up on the philosophy of giving. Sita Bhateja Speciality Hospital was founded on a charitable trust which has spent nearly a half century bringing healthcare to the less fortunate. I hope to raise funds for the treatment of needy patients through Sita Bhateja Speciality Hospital’s charitable foundation. 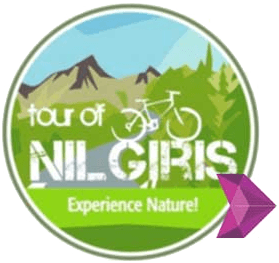 So, in a couple of weeks, in the name of charity, I will be riding the Tour of the Nilgiris – one of the premier cycling events in the country covering more than 900 kms over the course of 8 days. During the tour I will push my limits even more but I am not afraid as in the last year I’ve already come further than I ever dreamed. 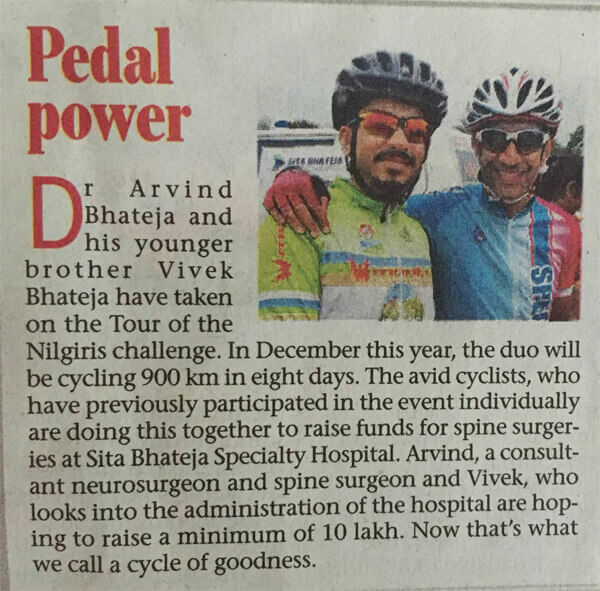 Last year, Sita Bhateja Speciality Hospital’s charity rider in the TfN, Gautam Raja, raised 1.2 lakh rupees. I hope to better that this year, with your help.